From day one, Romeo has been a character! We are sure his motto is "No Fear", his favorite thought is "she doesn't mean me" and when made clear you do indeed mean him, he gives you his "Who loves ya baby?" look. As you can see by the field shot above, his pointing is intense, he has an excellent nose, loves the water, tons of natural ability and a great all round boy. 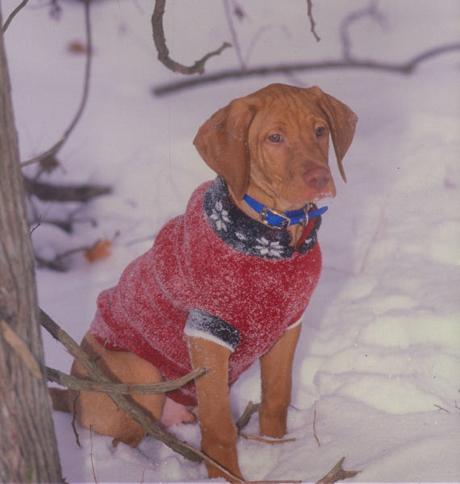 When we purchased Ro from Onpoint Vizslas in Dec, 2004 (born on Oct 22, 2004), we were hoping we would be able to one day use him for stud, blending field and show. 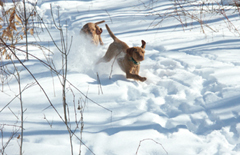 Combined with his hunting instincts, he has a handsome head, loads of bone, and great temperament. His health checks are all done and passed. He was awesome in the NAVHDA natural ability test, earning a score of 110 out of a possible 112 points at under 12 months for a Prize I. Sitting on 3 conformation points for awhile, he came into his own in the show ring earning 8 points in 2 weekends, finishing his Championship with a point to spare. He jumped the gun for his "stud service" career, breeding Breeze on day 17 of her cycle, producing 7 pups. 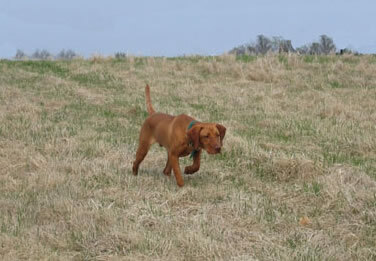 Our field trainer/handler, Liz Outram, handled Romeo to his FDX fall of 2008. Although he is now retired, Romeo's legacy is carried on through his progeny. 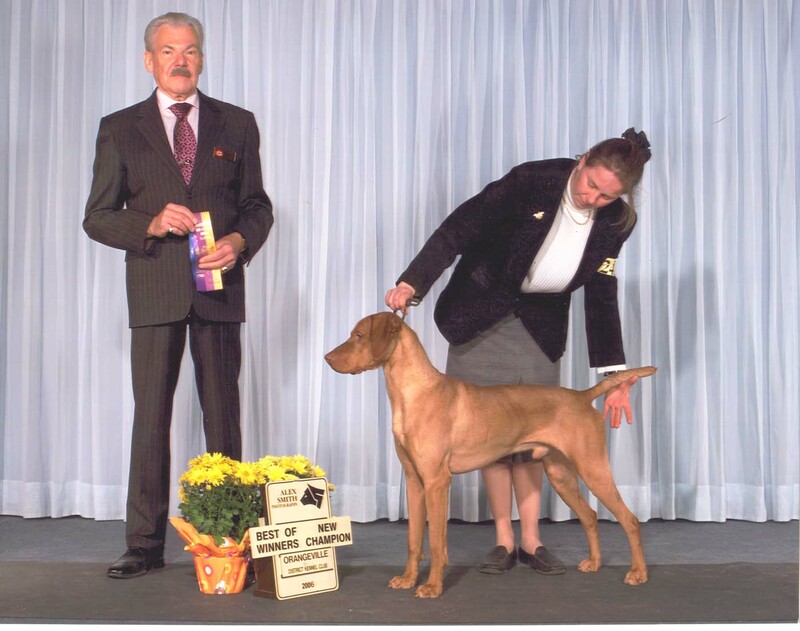 He sired Ch Egerton's Epic Winning Edge, FDJ, #1 Vizsla in Canada in 2010, #2 Vizsla in Canada in 2011 and Ch Egerton's Ice Blossom, FDJ, # 2 Vizsla, #1 Female in Canada in 2009 and 2010. 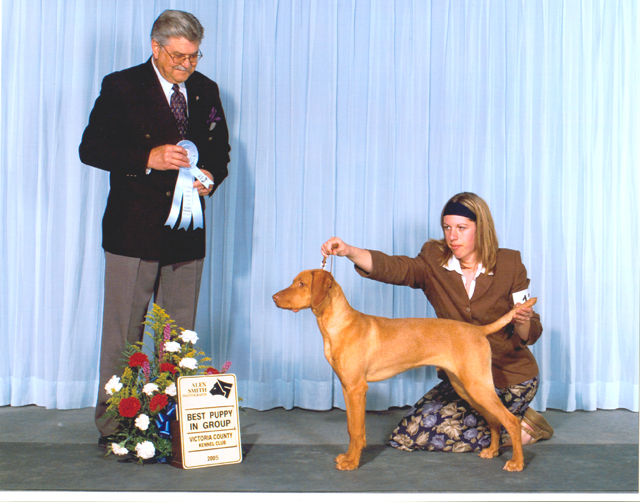 He sired Xena for Our Dream Kennels and his Grand pups include MBIS, RBIS GCHEX Egerton's River of Dreams, FDJ and many others who excel in both field and show.